If you happened to be in Busan for a show two years ago and saw a boy vomiting in front of the train station, you’d probably try to weave past them quickly. You might have been annoyed but didn’t put too much thought into it since this is a normal occurrence. Now, if that guy was also singing the bacon pancake jingle from Adventure Time and being laughed at by two girls, you might have just accidentally missed your opportunity to meet Drinking Boys and Girls Choir, or as they like to abbreviate - DBGC. They would have just been at a concert; currently making their way back home in Daegu. This isn’t a criticism; anyone would have missed this lucky chance because I also just described a regular scene of some damn drunk kids. The members of DBGC loved using their arms and body to explain themselves. The interview immediately gave life to all three members; they were like the pop sound and fizzle of a Hite beer can being opened. Their casual attitude reflected in their answers. They loved to poke fun and impersonate people. “We are Drinking Boys and Girls Choir. We like drinking and we are boys and girls together,” they told me. Bondu leaned into the microphone and added, “And we are very famous in Korea, number one actually.” They all started laughing, scrambling to tell me that it was a joke. “We will be,” was what they ended up correcting themselves with. DBGC is about to enter one of the biggest years in their career. They just signed with Damnably Records last August and are going to perform at the 2019 SXSW music festival in Austin. They are elated, but how this all happened is one big question mark. They didn’t always know the answers to our questions, especially when it came to their plans. However, DBGC’s shrugs which raised their shoulders up to their cheeks somehow managed to coexist with their increasing success. DBGC, kind of, just sort of, stumbled into signing with Damnably Records. MJ is the one who manages their email account and she told me that they almost didn’t get signed because she thought the email sent by Damnably was spam. “I track emails over ten times every day. I just found one; the title is hello. I thought it was spam and was about to throw it out…..but maybe? So I opened the email. Damnably’s George sent us an email asking, ‘How about you consider releasing in the US and UK. We thought he is cheating us.” Still hesitant, the band reached out to the lead singer of Billy Carter, Kim Jiwon, who had toured in England. With their detective caps on, they inquired if she had ever heard of this strange George person. She replied enthusiastically that if they got an email from him that’s amazing news. “When we have shows in Korea,” DBGC said. “So many interviewers always ask us ‘How did they [Damnably] find you?’ And our answer every time is ‘We don’t know!’” They made sure to wave their hands, exasperated, as they said ‘We don’t know!’ Yet, here they are, signed with Damnably and pretty exciting things are happening for them. 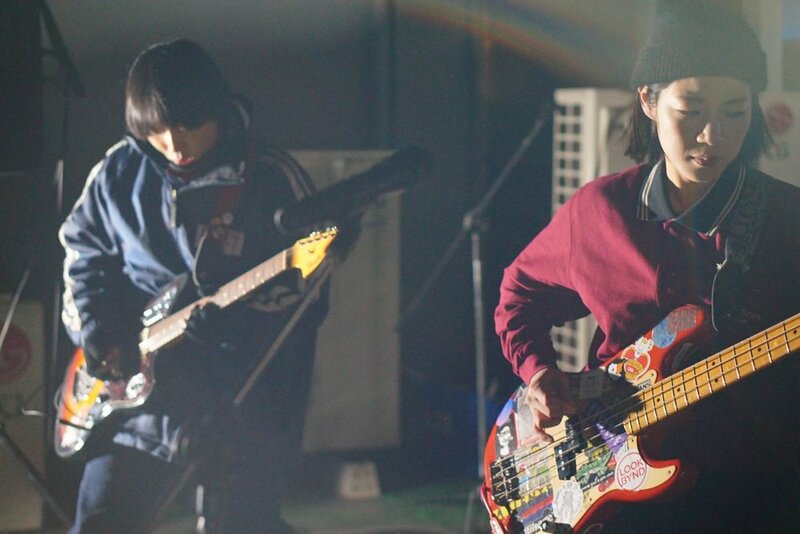 In March, they will go to SXSW with other Damnably signed bands; in April, they will play with Otoboke Beaver and Say Sue Me, two of Damnably’s most famous bands, on a UK tour. Resembling the first time a freshman gets invited to a university party and drinks a little too much when they are only supposed to be pregame, DBGC is slightly overwhelmed and haven’t exactly quite sat down and faced the events that are upcoming. DBGC stretched their arms above their heads as if they were praying; then asked no one in particular why they were the ones who were picked by Damnably. When I asked which band they would like to see in SXSW and if they knew much about Austin; they all sort of muttered to each other and scratched their heads. Meena said she was excited to see Jambinai but also mentioned that they likely would just line up for any band that had short lines. They admitted that while they knew SXSW beforehand, they didn’t know the reputation the festival had. A friend from California made sure they understood. “South By Souuuuuth West, The best band festival!” DBGC raised their hands in the air and attempted to growl as they tried to mimic his voice. Apparently, he repeated these exact words all the time. All three members of DBGC grew up in Daegu, the fourth largest city in Korea. Don’t be fooled though, the city is still a lot smaller than a normal Asian metropolitan city. “Daegu is a good city to live in. Not too expensive and there are so many colleges and universities,” DBGC said, “but old people are so conservative and they support the conservative party. When we participate in a progressive social movement like the Queer parade, we can see the clash.” The music scene there is smaller than Seoul or Busan and Daegu kind of has its own secluded scene. A typical Korean almost exists in a different world of language when it comes to indie music. They do not understand the concept of a band at all. DBGC kindly stood up from their chairs and reenacted how a conversation about their band normally would go. “You guys don’t have a singer? You had to be there but the performance was Oscar-worthy. DBGC explained that people don’t understand band positions as a concept; so forget any attempt to bring up punk as an idea. In fact, when they go to karaoke they are commonly told they should sing because of their band background. Many Koreans think that being in a band inherently means you are a talented singer. Drinking was part of their friendship right from the beginning. “At that time we don't have anything to care about,” DBGC said. “Every time is drinking, drinking and drinking. And drunker, drunker and drunker.” They started to imitate realistic vomiting noises. They impressed me, their performance was enough to prove that they were vomiters with professional experience. In fact, DBGC took five years to write their first album - Keep Drinking!!. It took MJ getting into a car crash to find the band’s motivation to work. MJ had a motorcycle accident and broke her back. She had to stay in the hospital for a few months. The accident suddenly gave DBGC a lot of time because they could no longer play music or do gigs. They still wanted to work on activities involved with the band and making an album became the only option. MJ got a Mac book and a drum kit and started recording music. “If she never had a car crash we never would have made the first album,” the band readily conceded. After MJ recovered, they decided to apply for government funding. Every city in Korea has a government art center and that center can provide funding for bands. In Daegu, there’s competition as only two bands get enough money to make a full-length album and five bands get to make EPs every year . DBGC became one of the two bands to receive enough funding to create a full-length album. Once again, MJ worked with the magic she used on Bondu to join the band and wrote an elaborate story to apply for funding. “I’m a really good writer. When I filled up the application form I wrote we are very good. This song is very worthwhile; this song is from my heart,” MJ cheekily smirked. While DBGC was grateful for the funding, they did not see this as a milestone. Even if they didn’t get chosen, they would have been able to record the album DIY. The good thing is they no longer had to pay for their own recording studio. Before they accepted the government funding, the band actually worked on the album in Bondu’s bedroom. Now, they had an upgrade. 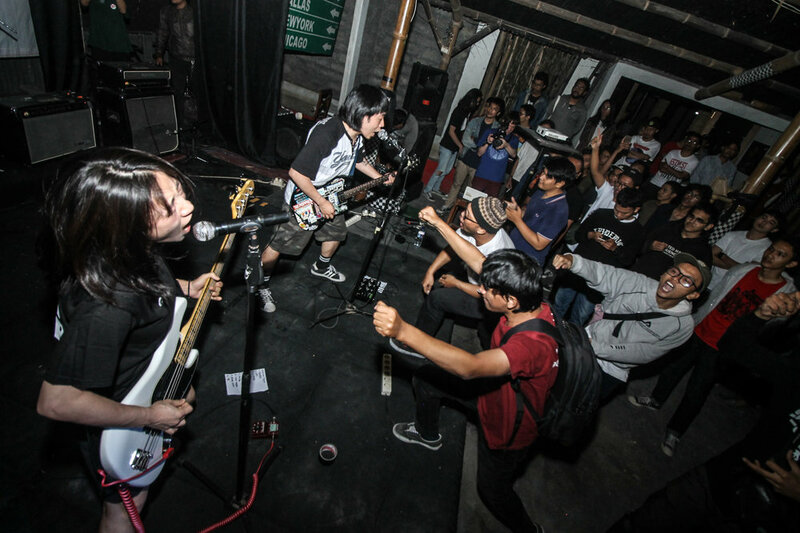 Koreans fall in love with punk music for the same reasons the rest of the world does; Meena especially uses the band to channel her anger and frustrations. “Even though the country is different,” Meena said. “Anger comes from the same stuff. If you meet a bossy person, you feel angry. If the government controls what we do, we feel angry.” The punk scene is small, and they might know everyone who shows up to their concerts. Yet, this scene is special and almost is like a home. They also share their anger in their album. The song “She's Sitting in the Blue Chair” is about the former Korean president Geun Hye Park who always tried to control artists and press. “My friends got a penalty from the government because they drew satirical paintings on the wall,” Meena said. “She [Geun Hye Park] was finally impeached but some old people in Daegu don’t believe negative news which is very frustrating.” The news Meena is referring to happened in 2016; where it was discovered Park had been allowing a non-government citizen to influence Korean policies and extort money for personal entertainment events. I remember getting together with a group of friends with the intention of completing a project and wanting to get something done. Then, someone pops open some alcohol and at first, everyone becomes more passionate and the project seems to move at a faster pace. You just need one friend to finally say something stupid and the brainstorming becomes a whirlwind of utter nonsense. While the next day would always bring a bit of regret because nothing got done; the night was always a blast. DBGC talked about their journey as a band in a similar way. They talked over each other, disagreed with one another and would get off track. Yet it was fun, and they were always laughing and I felt a lot of love between them. They have gotten things done despite it being a long journey. Better yet, that long journey continues to morph their music. I’d say the band has one simple message for all of us. “Keep Drinking!! With Tiny Caution”. Their first album will officially be released by Damnably Records on the 22th of February. You can preorder it by clicking this link.